The Branson Regional Arts Council invites all area residents to experience two amazing Branson shows for equally amazing prices! 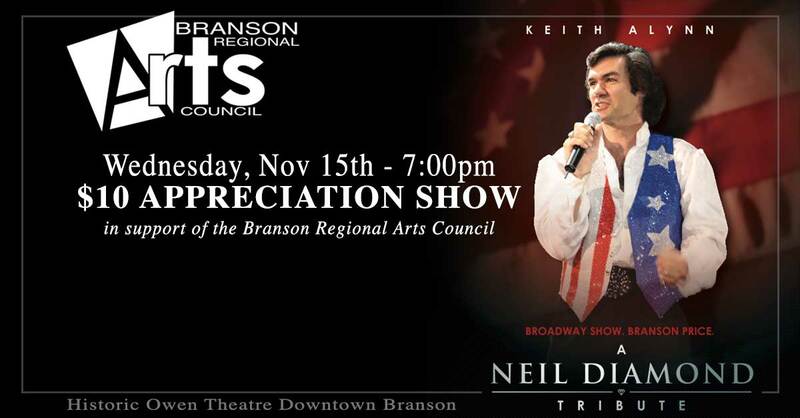 Keith Alynn’s A Neil Diamond Tribute and Dianna Lynn’s Carpenters Christmas Once More, are both showing their support of the Arts Council by inviting area residents to see their award-winning shows in exchange for a $10 per seat donation to the Branson Regional Arts Council. These seats can only be reserved through the payment links below. All major credit cards or PayPal is accepted. 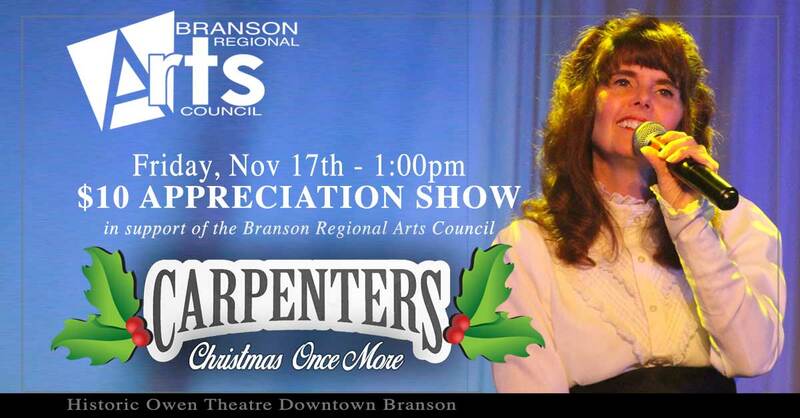 Please join the Arts Council in showing appreciation for these wonderful performers who have endeared themselves to the Branson community for many years. Their shows are tremendous, and their support of the Arts Council’s upcoming transition into the Historic Owen Theatre is appreciated. “The Carpenters Christmas Once More” features the incredible hits from the brother and sister duo that delighted the world with their love songs! This show stars Dianna Lynn and her amazing ability to replicate the unique vocal qualities of Karen Carpenter; an exceptional singer and gifted drummer whose smooth and beautiful vocals made you smile and cry as she helped create the soundtrack for dances, weddings, and other celebrations in the 70’s and 80’s. She may have left us far too soon, but her legacy lives on in gorgeous songs that have endured throughout decades of hair bands, hard rock, house music, and rap. Good music never loses its appeal! Come celebrate one Unforgettable Voice and one unforgettable duo, with the sounds of The Carpenters Christmas Once More featuring Branson Show Awards 2016 Tribute Show of the Year. From the birth of this dynamic duo to the last of their public performances, this heartwarming show highlights hits like Close To You, For, Postman, Ticket To Ride, No Place Like Home, I’ll Be Home For Christmas, Sleigh Ride, The Christmas Song and many more! You never know who might pop in to Celebrate the Sounds of Carpenters Christmas Once More during the show. Quick Change, multi media, comedy and incredible vocals round out this 90 minute, heartfelt tribute. “A Neil Diamond Tribute” gives Branson its very own pop legend, or the closest thing to the real Neil Diamond you’ll ever see and hear, courtesy of veteran tribute artist, Keith Allynn! It’s not hard to find look- alikes; it’s not hard to find sound-alikes, it’s rare to find both embodied in one sensational artist, and he’s performing right here in Branson’s historic downtown district. Few artists ever achieve the level of superstardom enjoyed by Neil Diamond; he’s won both a Golden Globe and a Grammy, been recognized at the Kennedy Center Honors in 2011, and found a long list of his songs on Billboard’s Hot 100 chart, including #1 hits, Cracklin’ Rosie, Song Sung Blue, and You Don’t Bring Me Flowers. His other Top Ten hits include America, Sweet Caroline, I Am…I Said, and Longfellow Serenade. It’s a daunting task to take on such a legend, but Keith Allynn assumes the role with ease…the look, the voice, even the mannerisms; it’s not merely an impersonation, it’s a passionate tribute of epic proportions! NOT A MEMBER YET? SIGN UP FOR BASIC ARTS NEWS UPDATES! Financial assistance for the Branson Regional Arts Council is provided by the Missouri Arts Council, Mrs. Jean Cantwell, Titanic Museum Attraction and many other generous sponsors and active members.